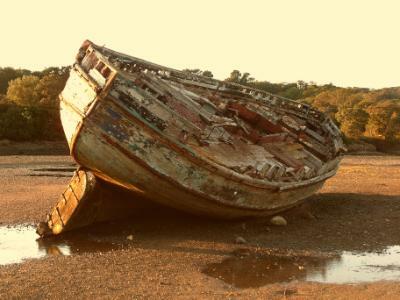 The shipwrecks at Dulas Beach are a beautiful and intriguing feature of this excellent and beautiful alternative beach. It's far more interesting to speculate about how this boat and its partner were left here to decay than know the facts. I think of them as remnants of an Alister Maclean adventure. What story will you come up with? As I wrote earlier, Dulas Beach is a bit of a misnomer really. 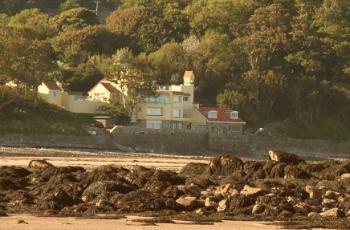 The rocky reef beach on the seaward side of the bay next to TRAETH YR ORA BEACH is also a fascinating place to explore. You'll discover an elephant’s graveyard for crabs that sets you wondering what on earth’s been going on. The best description of this unique beach is that it is a very interesting broad estuarine lagoon between Afon Goch (Red River) and the sea. It really isn’t a beach to go sunbathing or swimming because the sea is about half a mile away and at low tide it is mostly fine mud. This is a walking beach. One of my last Summer visits was with my cousin, Fiona. It was a lovely evening and we spent a glorious hour just traipsing to the abandoned boats and checking out the tidal pools. This is a truly wonderful and interesting area to explore, as long as you keep a close eye on the tide. Otherwise you will find yourself in trouble and separated from your car by a very wide stretch of water. Wading back to your car may not be an option as many people have discovered. If you’ve wandered across to the opposite side of Dulas Bay then you’ll find that you have one heck of a long trek back to the car. If you find yourself in difficulty it can be a very lonely beach. The seaward side of the Dulas lagoon is also estuarine in character. Don’t worry though, what it lacks in basking sand is more than made up for with a large area for exciting rock pools full of interesting beasties. Why not take a magnifying glass with you. Remember you are exercising scientific interest and not indulging in an invertebrate barbecue. At Dulas Beach parking your car is a real challenge. This explains why the hoards don’t fall upon this area. However, if you choose to arrive by the Isle of Anglesey Coastal Path there will be no problem with access. The Afon Goch estuary has a good carpark where you can bring your sandwiches and flask of tea to gaze contentedly at the birdies or look along the lagoon. All the way across the spit to the intriguing tower of Dulas Island in the distance. From Llys Dulas the very narrow road ends rather abruptly. Get it wrong and you'll be weeping as the tide starts to claim yet another victim. All things eventually dissolve in seawater. Even your dream car. If you step down onto Dulas Beach from the Llys Dulas side and wander a few hundred yards to your left you will discover two large old wooden fishing boats. Both on their sides and the more adventurous may choose to climb on board. Take great care though, because even though most of the decking looks solid enough, it has been under the tide for decades in a state of self-pitying decay. The outgoing tide leaves shallow pools and in these you will hopefully find trapped schools of small fish fry. My friend thinks they are haddock. There again, the only fish he can name are usually battered. 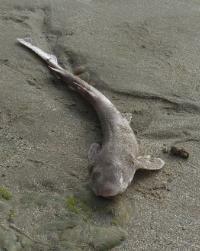 Put his ignorance to one side for a moment and treat yourself to Dulas Beach's natural marine life in its many forms. This estuary at the bottom end of Dulas Bay Beach and an easy delight for ornithologists. With many different species of bird life on casual display it becomes a delight for young children. This area can be reached by a good road down from the A5025 Coastal Road. On the other side of the bay opposite the Llys Dulas entrance to the beach you can see a track leading down through the trees. 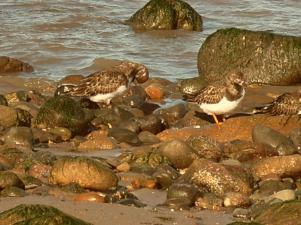 This is reached from the LLIGWY BEACH road. Of course, you could always wander onto Dulas Bay Beach from the seaward side by walking along the coastal path from TRAETH YR ORA BEACH. 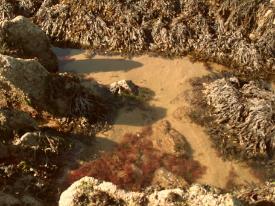 This is also very interesting because you have to cross over boulders and fascinating rock pools. As I have written in the description of the Traeth yr Ora Beach area, this appears to be an elephant’s graveyard for crabs and sets you to wondering what on earth’s been going on. This beautiful house is Portobello. It is a delightfully well-placed art-form, which is the Summer house of the family of Llys Dulas Estate. • No major prohibition on dogs, but please keep them on a leash at all times. • Though not here at Dulas Beach, there are Seasonal Prohibitions on dogs on certain Anglesey beaches. 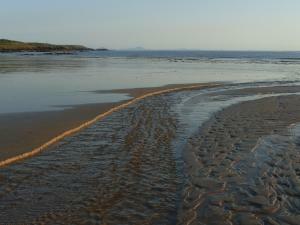 Dulas Beach is another of Anglesey's isolated beaches and its best facilities are its peaceful natural beauty. At Dulas Beach you can sit and reflect in casual wonderment at being so far from all that reminds you of work and home responsibilities. You can also reflect on your hunger. Unless you are Hunter-Gatherer you'll need to travel a few miles back to either MOELFRE or BENLLECH. There is only a single car park. Nothing more. Do you have any questions you'd like to ask? I would love to hear from you. Please feel free. ASK YOUR QUESTION by CLICKING HERE. Although the A5025 is an excellently surfaced road, most of its length is limited to a 40mph speed limit. There have been a number of recent tragic accidents in this area. The dangerous stretch are the dips down into Dulas City. Speed is a killer here. So, look after yourself and others on the road. There are three road access points to this beach. Start from Benllech on the A5025 coast road and take the first left turning at the obvious Moelfre roundabout. Continue on this road for about two miles and straight through the very, very small hamlet of Brynrefail. A mile or so later you will see the road sign for CITY DULAS. Down the hill and up the other side. At the top of the hill take the first right turning and follow the road down to Dulas Beach. OR, take the second right a hundred metres further. This will take you to the Llys Dulas side of the beach. Again, start along the A5025 coast road and take the first left turning at the obvious Moelfre roundabout. Continue on this road for about two miles to Brynrefail and take the right hand turn opposite a craft shop above you the left. Follow this road down for a mile and turn left at the junction. Follow this road until you can travel no further. Walk the rest of the way down to Dulas Bay. Again start along the A5025 coast road and take the first left turning at the obvious Moelfre roundabout. Follow the road until it finally ends in a muddy track that will take you down to the south side of Dulas Beach. If you can find a place to park here on the side of the very road then do. But take care of people’s entrances. On the last left corner before the muddy track begins you will find a track leading down into the woods. It is signposted with the Coastal Path logo. Follow this track ever downwards past a small field with about eight caravans hidden from the world. Carry on out of the woods until you are standing looking out over Porth yr Ora Beach. From this vantage point you can really appreciate the astonishing beauty of this area of the Island. When I'm on the beach and a profound desire strikes me, then I pick-a-stick and write the thought or desire in the sand to allow the sea to carry it to the world to be brought back fulfilled.